Valentine’s Day is fast approaching and at my daughter’s school they did something pretty cool this year. They wanted their students to decorate and bring in a valentine holder for their valentine cards and treats. 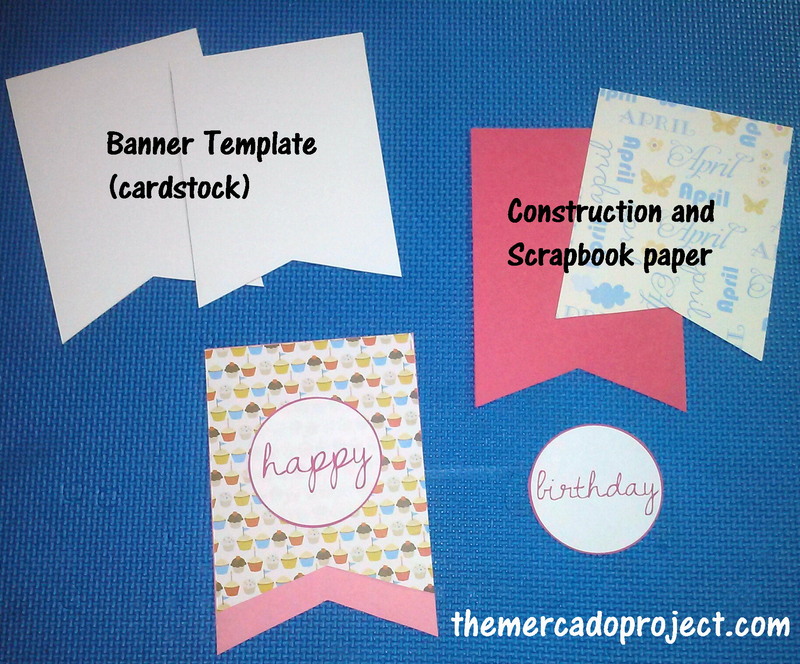 and glued a piece of purple construction paper in the back and decorated it with a variety of stickers. 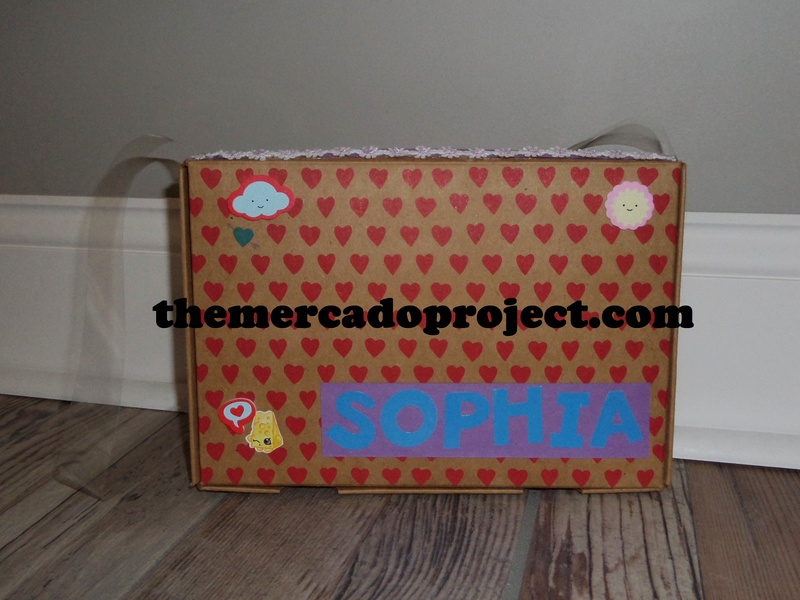 I secured the box with a little bit of clear tape and made a slot, which we decorated with a fabric, flower ribbon, for the valentine cards and treats to go in. 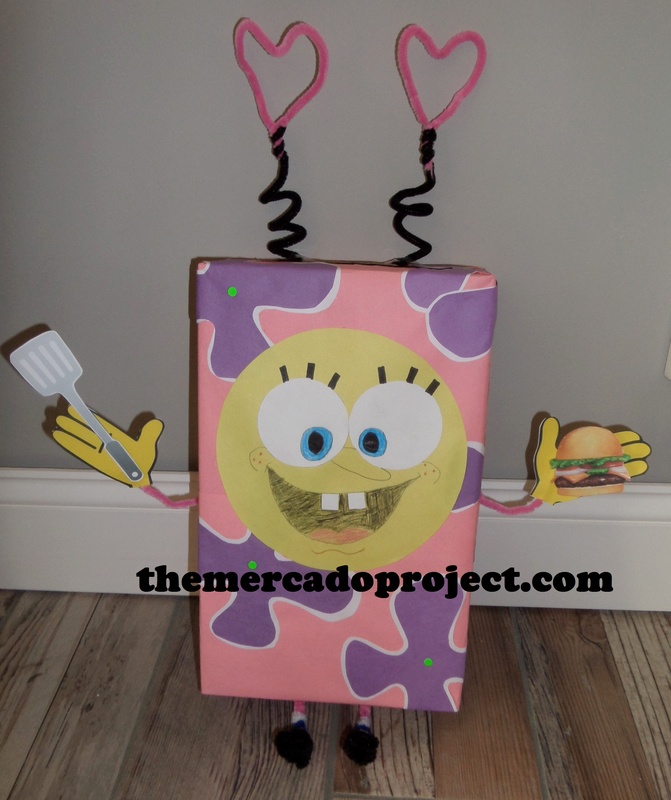 As for my third grader, she had a vision and it involved one of her favorite cartoon characters, SpongeBob Squarepants. She loves that little dude! 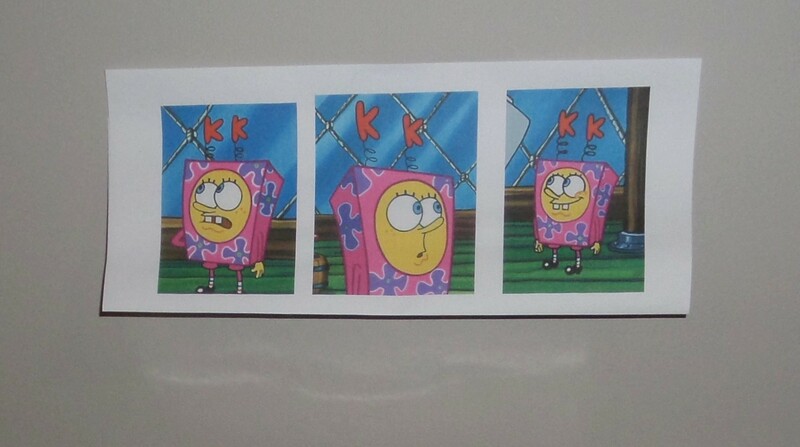 We printed out some pics of SpongeBob wearing the uniform so we could easily reference it. 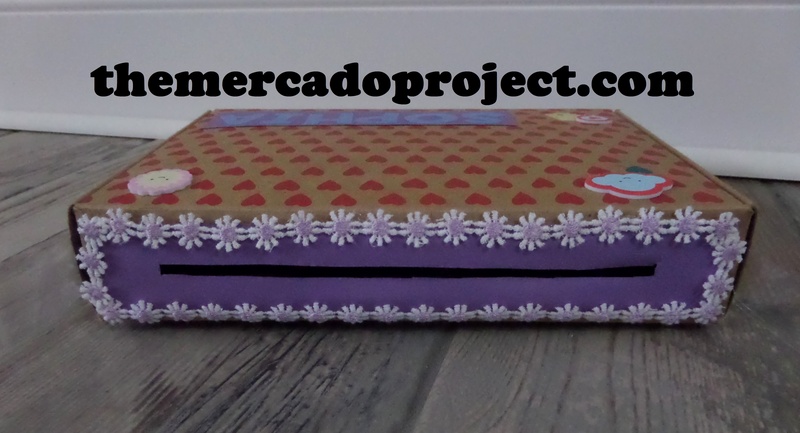 I also made a template of the purple flower design that’s on the uniform so my daughter could easily trace, cut, and glue the design onto the box. 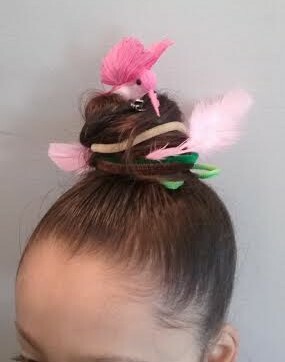 The materials we used were a cereal box, construction paper (pink, yellow, purple, white, and neon green card stock paper), and pipe cleaners. We also printed out a small spatula and a “Krabby Patty,” which we taped onto his hands. 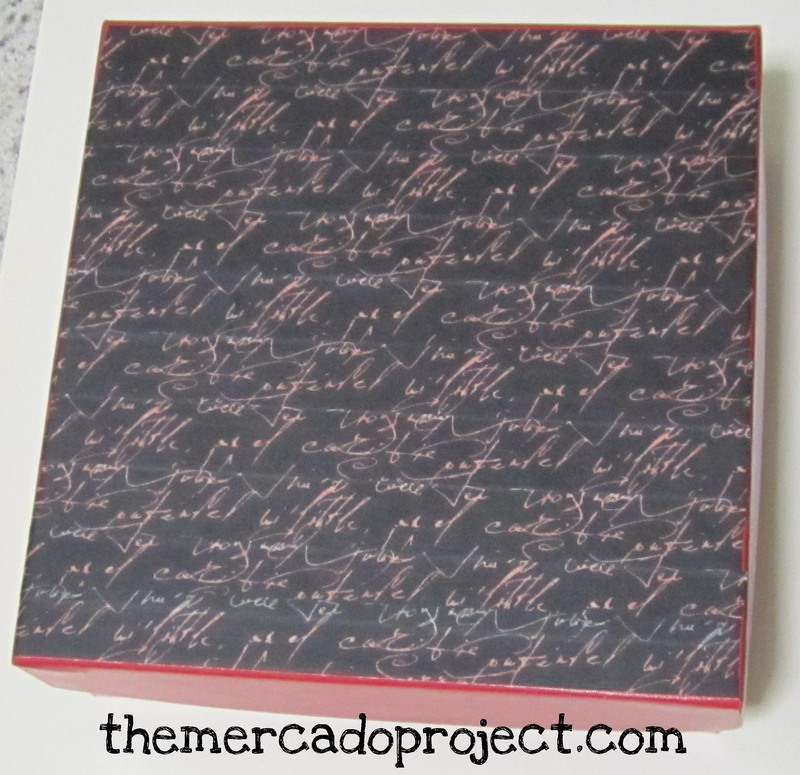 Here’s the breakdown: We gift wrapped the box with pink construction paper using tape and glue. My daughter traced a big circle out of yellow construction paper for his face and two small circles for his eyes with white paper as well as two little squares for his front teeth. She then drew the details herself. 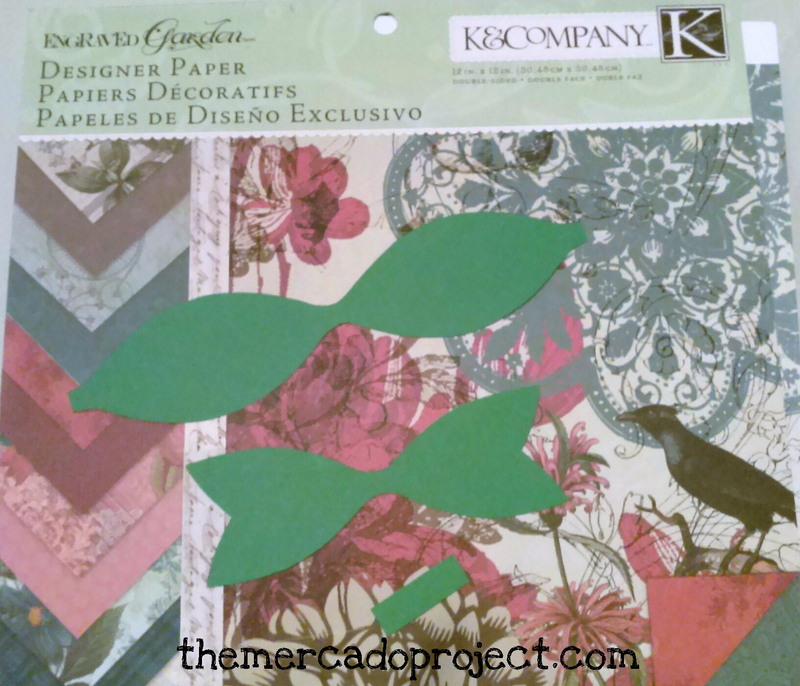 She used the template for the purple flower designs and we glued those down as well as his face. 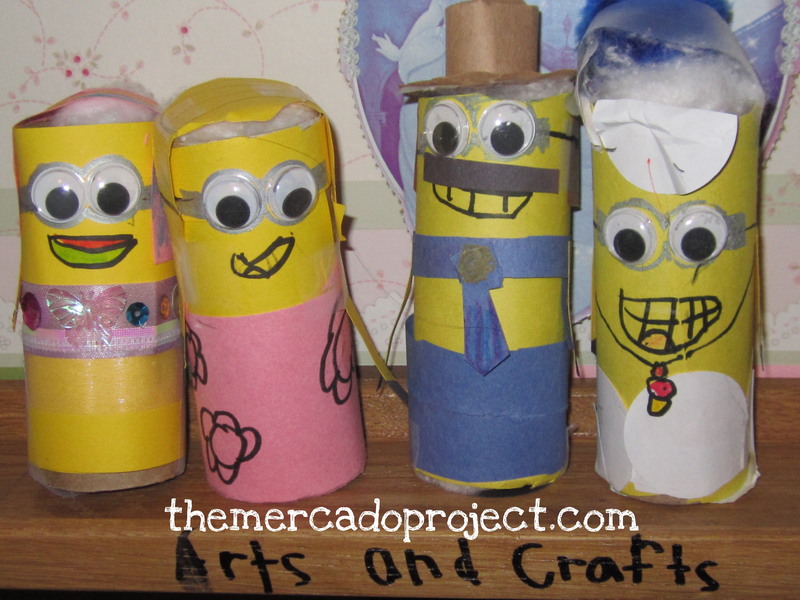 The pipe cleaners were used to make the antennas, arms, legs, socks, and shoes. 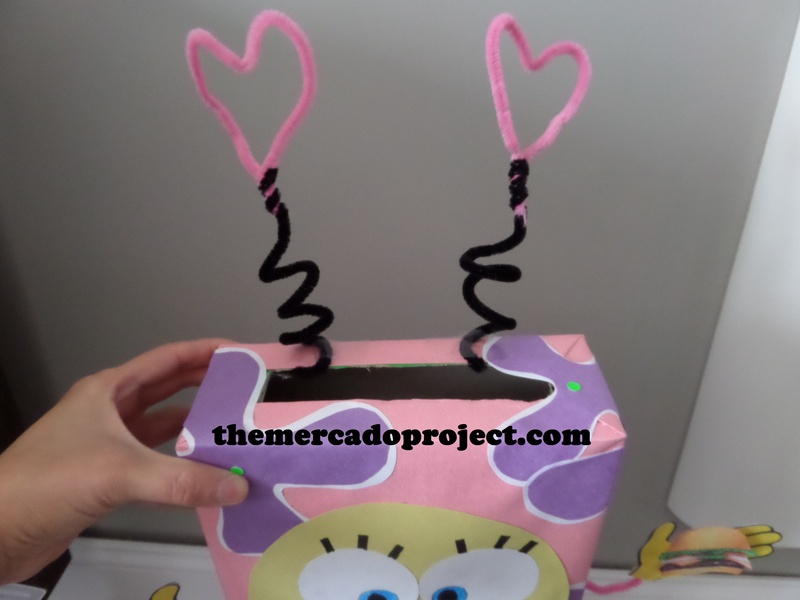 She wanted to place two pink hearts on the antennas instead of the red K’s. 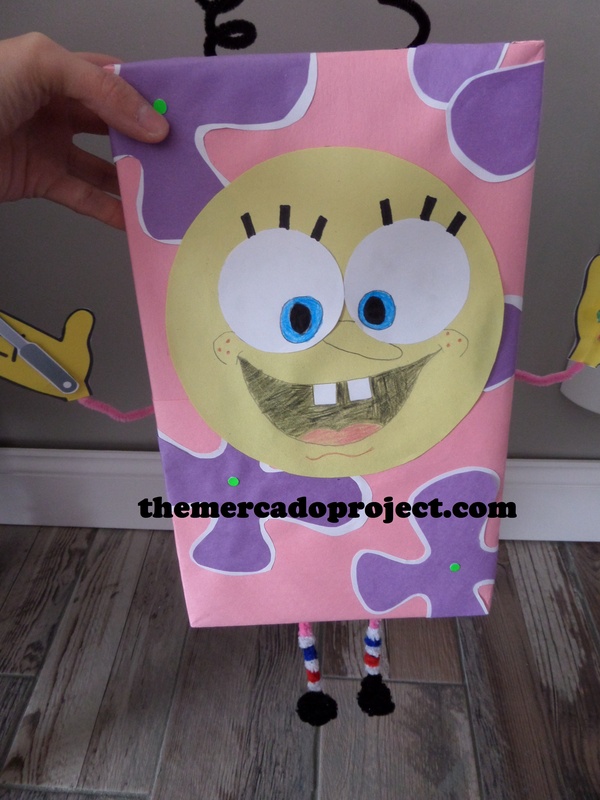 For his yellow hands I copy and pasted a picture of SpongeBob and cropped the pic until his hands were the only things on the screen, then printed and glued onto the pipe cleaner. 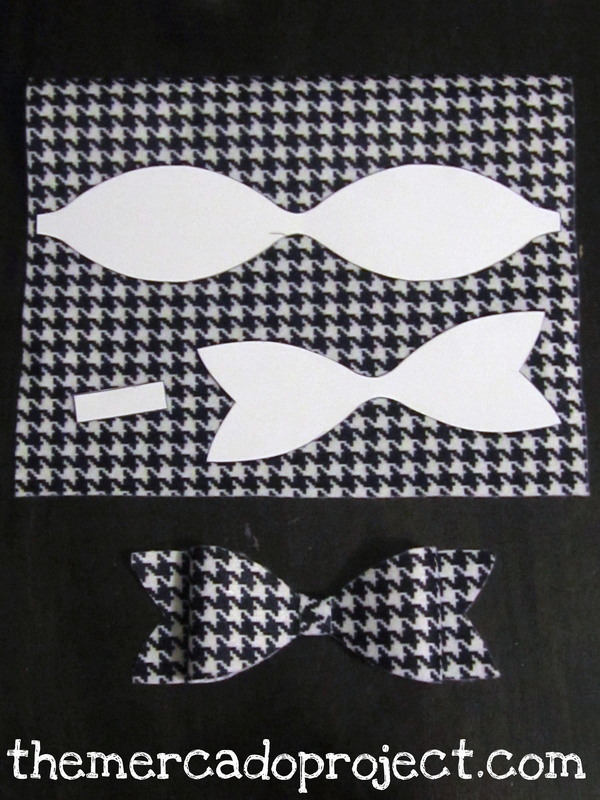 We did the image two sided so it was easier to glue. A slot at the top of the box ensures that valentine cards and treats will go in nicely! My youngest daughter turned 4 years old this past Saturday. I wish I could have captured on camera how her morning, sleepy face transformed into sheer happiness upon hearing us say, “Happy Birthday Sophia!” It was magical and so sweet. I did take a ton of pictures after we got all dressed up, but I have to sort through them first. 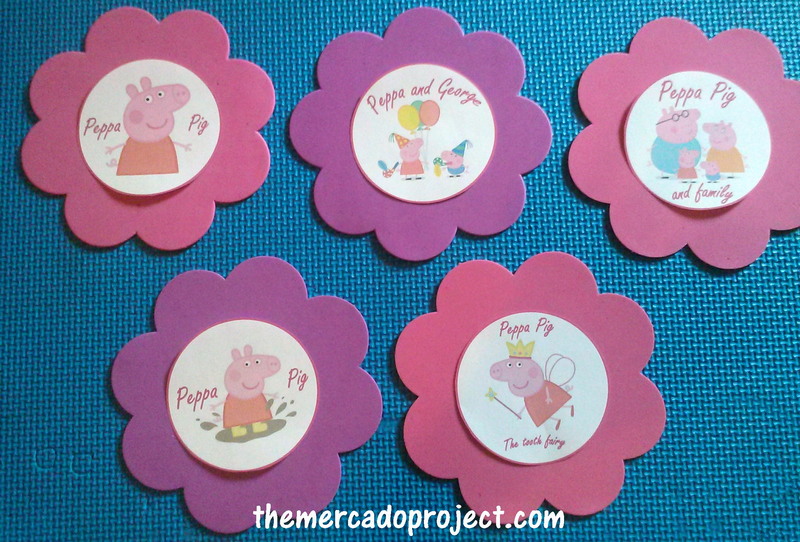 For this post, I wanted to share with you how I made her a Peppa Pig birthday banner. This banner was super easy to make and didn’t take long. I found the banner template online. I had foam flower cut outs saved from a great find at the dollar section in Target. I did the happy, birthday, and letter circles myself on Word, then glued everything together and strung it up with pink ribbon. I absolutely loved how this banner came out and my daughter loved seeing it up on the wall. 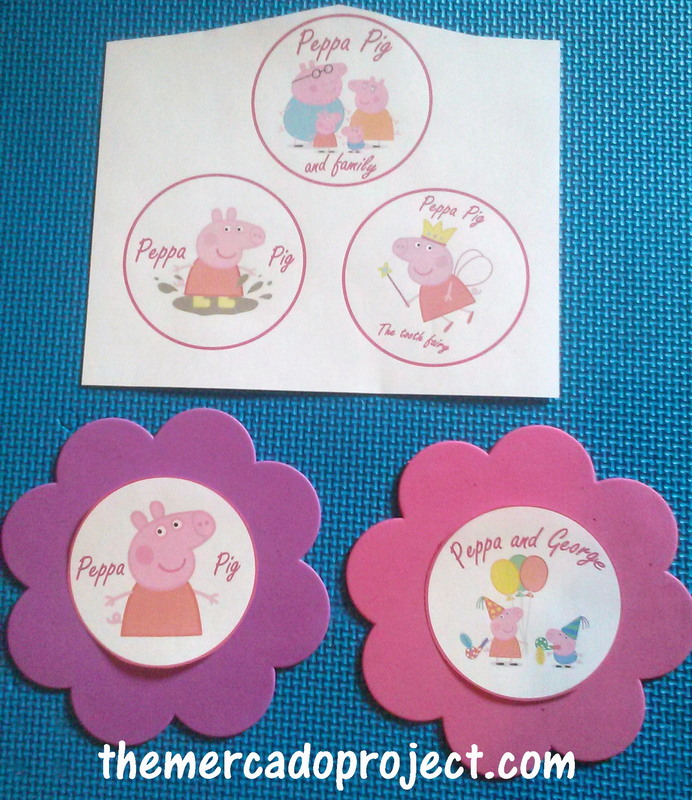 The theme was Peppa Pig and she loved seeing all the different pictures of Peppa Pig. 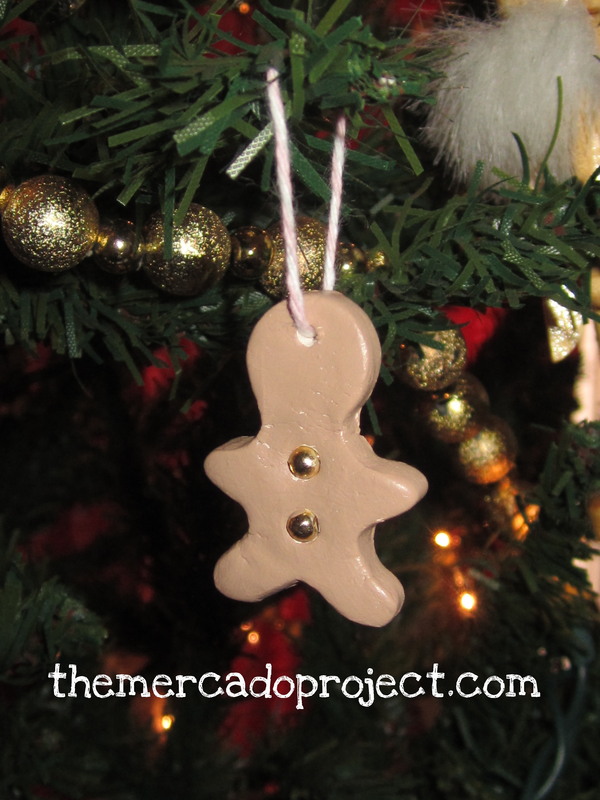 I wanted to see if I could make some Christmas ornaments using cookie cutters and air dry clay. Guess what? It worked. 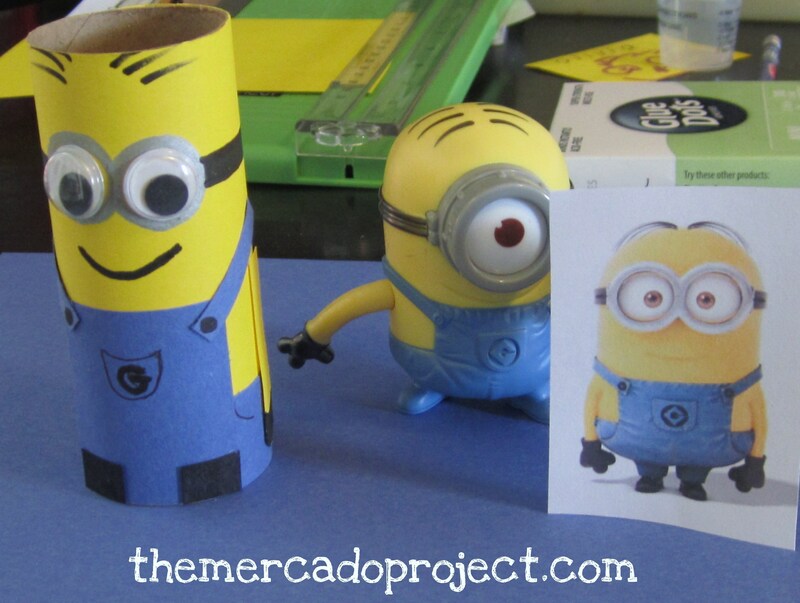 This is going to be a great project for the weekend with my girls. 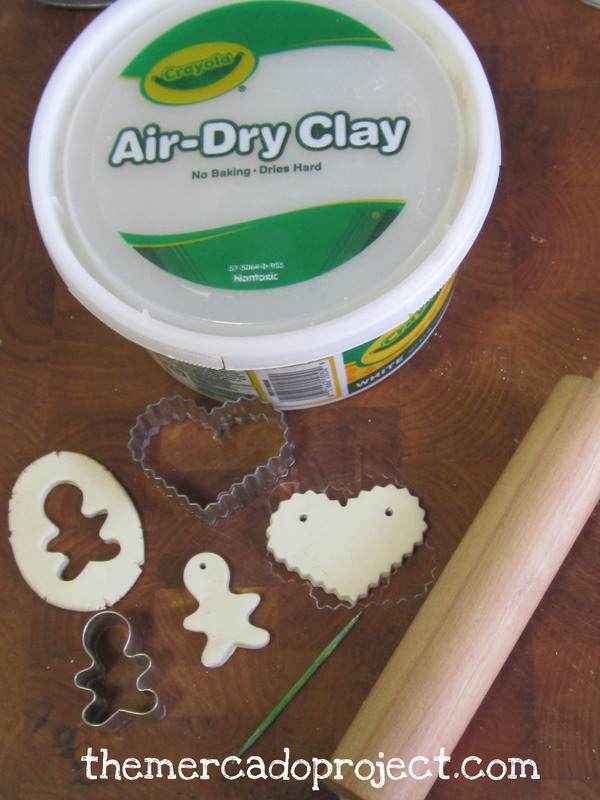 According to the container, it takes about 2 – 3 days for the clay to dry. Since I pressed little beads into the clay it did crack a bit during the drying process. I just used a toothpick and inserted a little bit more clay in the areas that was noticeable then let the clay dry once again. 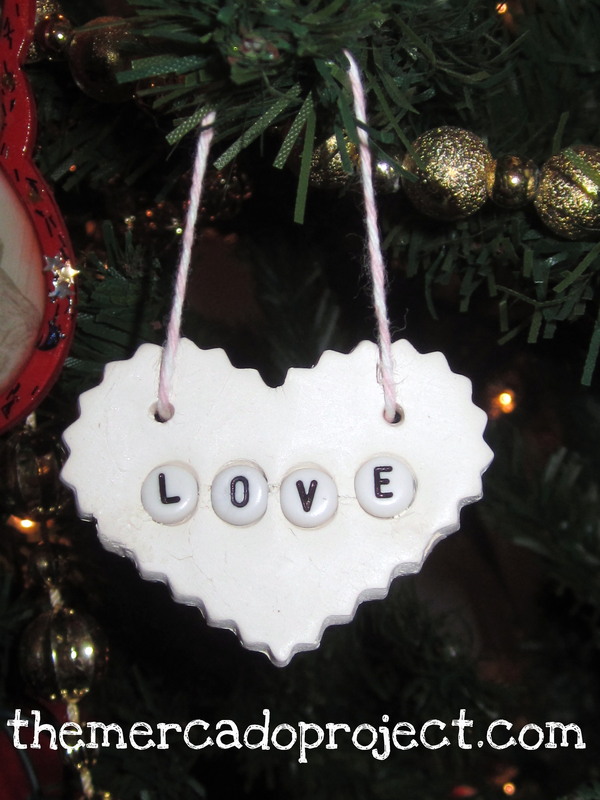 I used pink and white twine to string it up the heart. I painted Mr. Gingerbread a lovely Acorn color (Martha Stewart acrylic paint) with a small paintbrush. 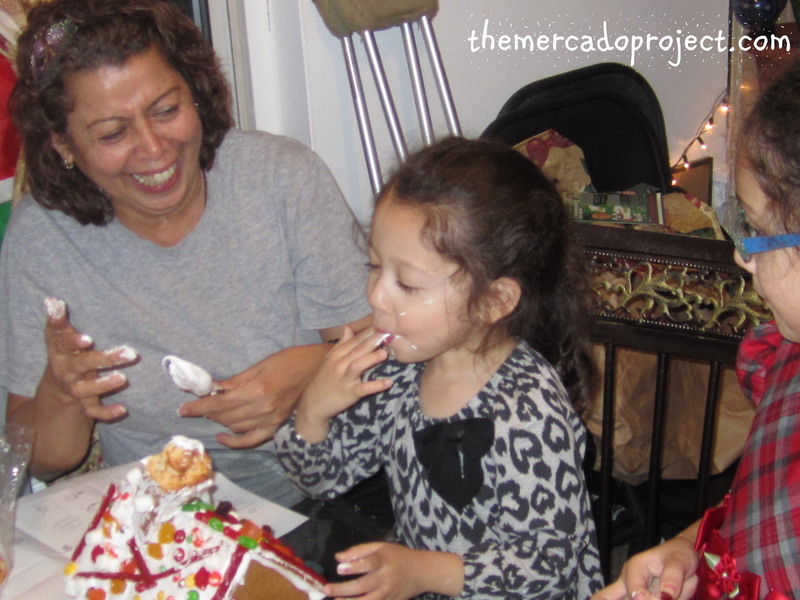 This project has endless possibilities! 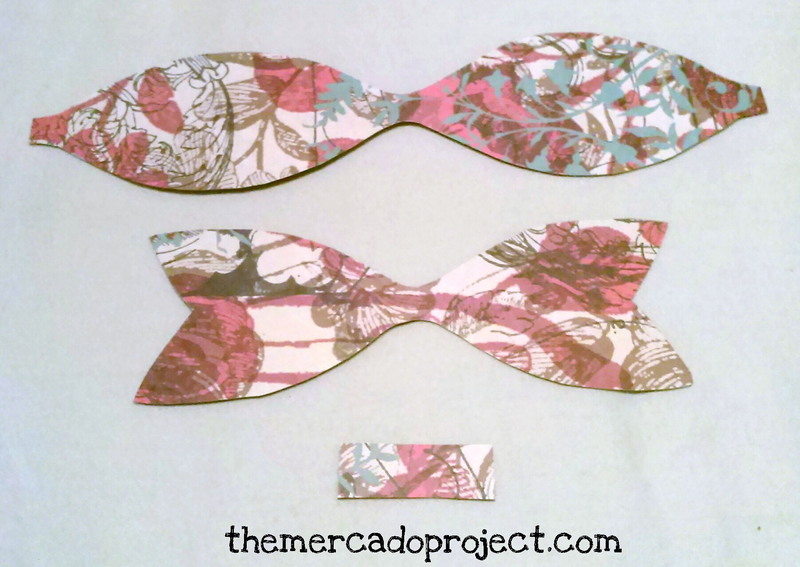 I’m officially obsessed with this paper bow template (http://howaboutorange.blogspot.com/2013/04/how-to-make-paper-bow.html) and that’s okay with me. 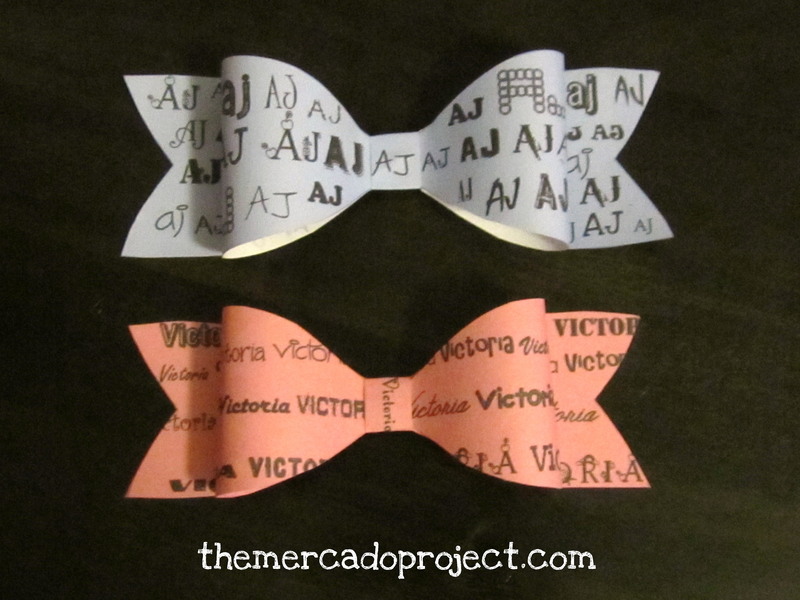 I’m going to my niece and nephew’s birthday party and I wanted to personalize their gift bows. 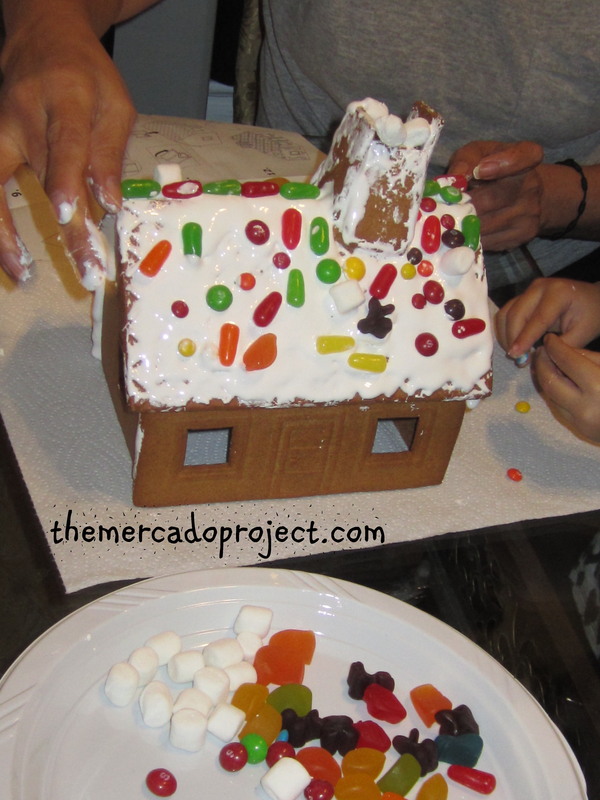 It takes a little time, but the end result is wonderful, at least in my opinion! 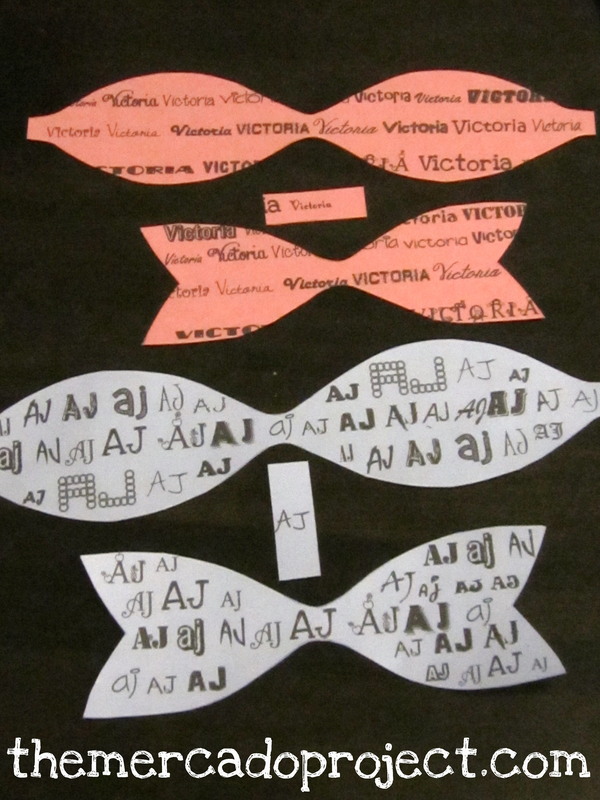 I used construction paper for the first bow and printed out the name in various fonts on Word. For the second bow, I scanned the template and uploaded it on Word, then changed the color and inserted the name, here and there in various fonts as well. 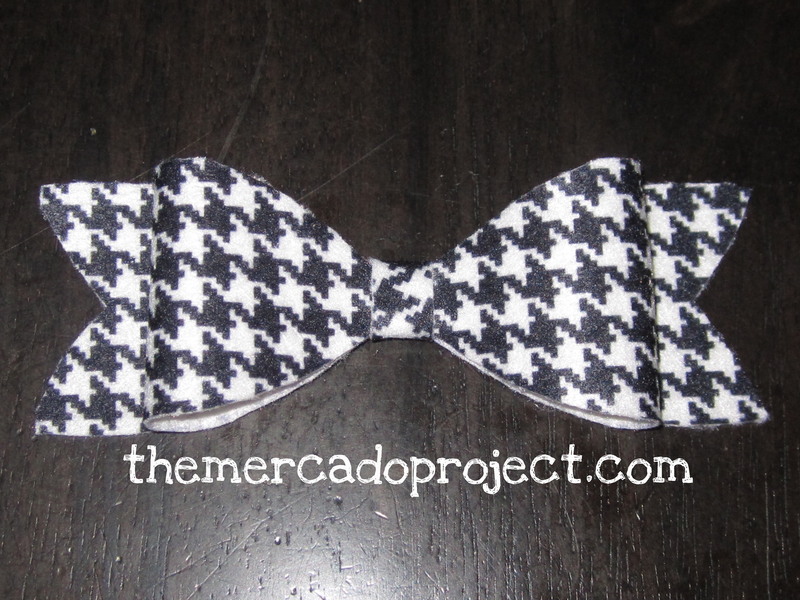 I love these personalized bows and can’t wait to make and use them for my Christmas presents. 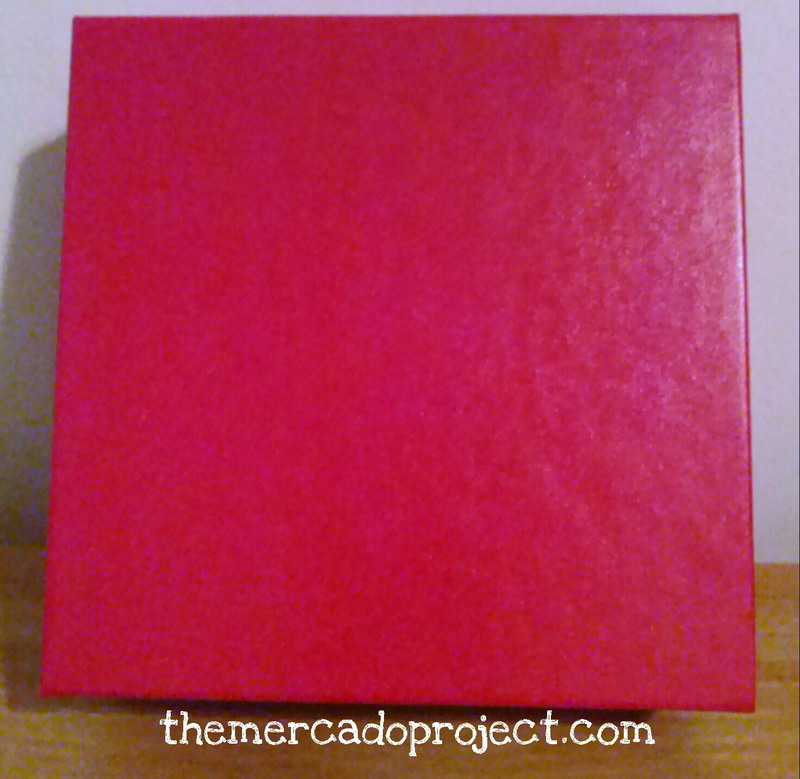 Here’s an idea to spruce up any plain boxes you may have around (in my case: a cardboard red box that stores my bracelets) or even gift boxes for upcoming Christmas presents. 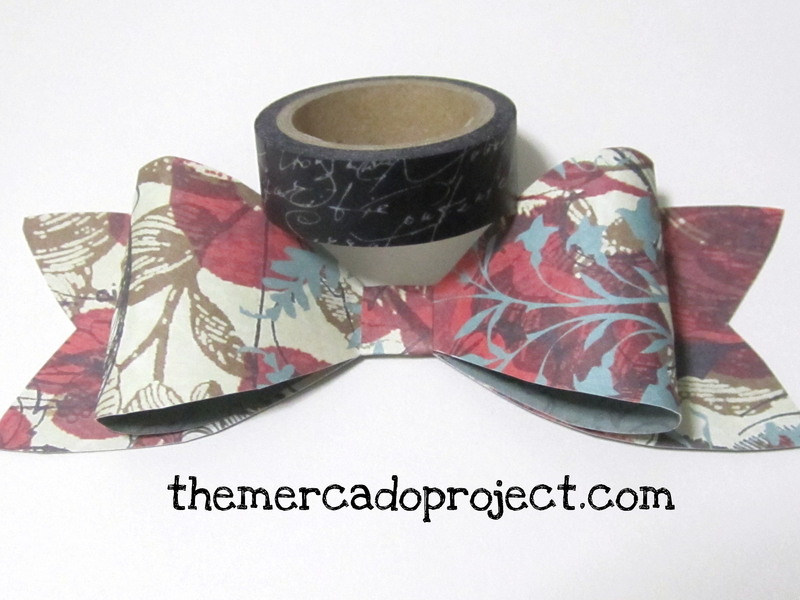 You can use washi tape. 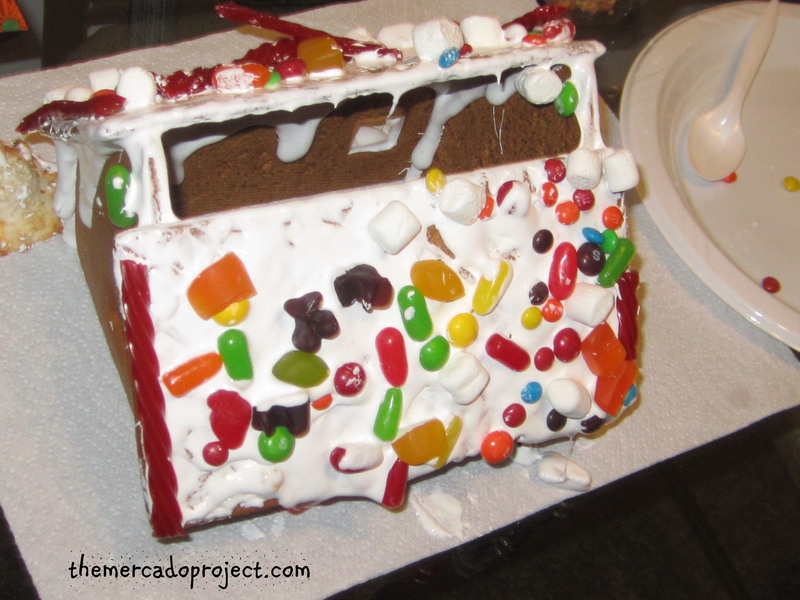 They come in many designs and can be easily removed so if you make a mistake or get tired of the design, just peel it off and reposition or pick another design. 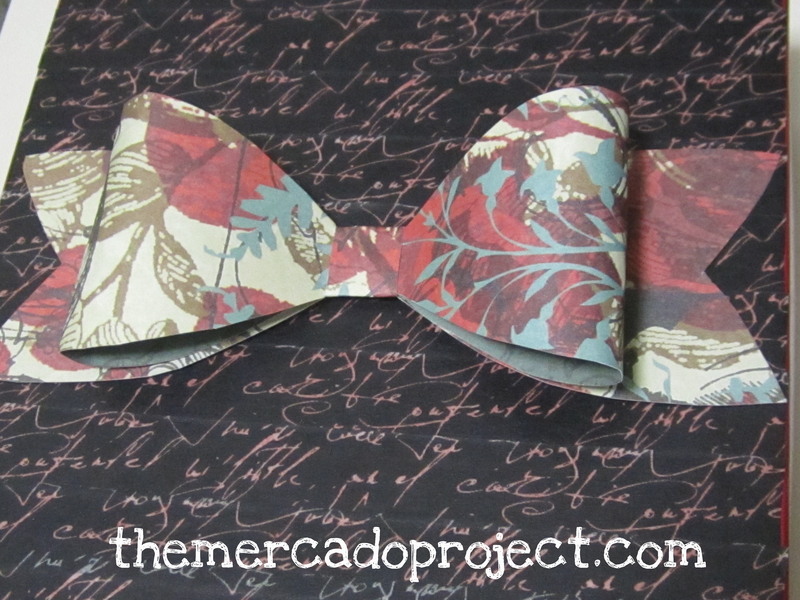 I chose a script writing washi tape that I found at A.C. Moore on sale. These little tapes can be expensive so when they go on sale get as many as you can. 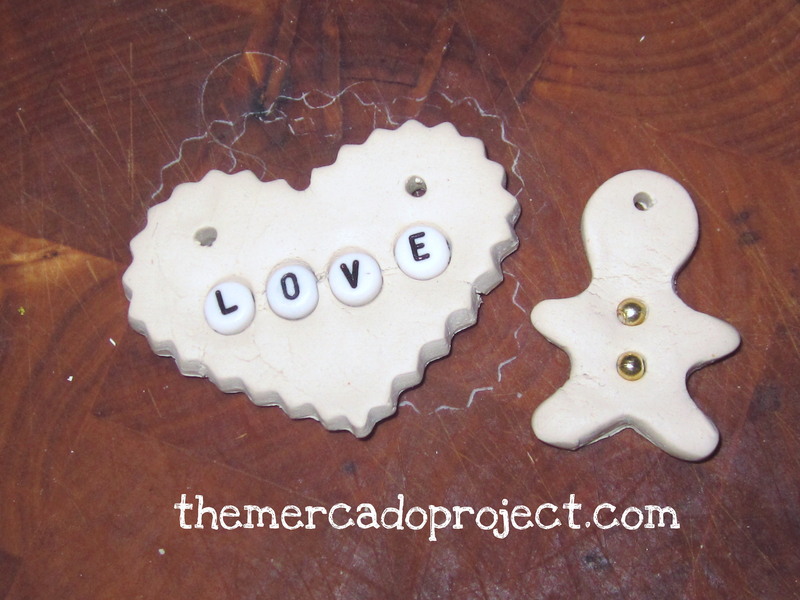 If you’re a crafter, you won’t regret the purchase. 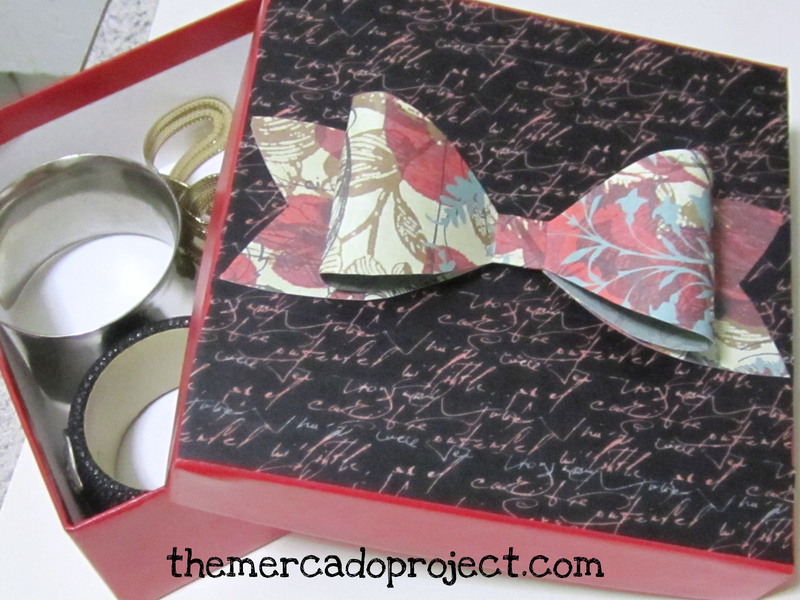 I just covered the top of the box and lined up the tape so it would look like a continuous design. 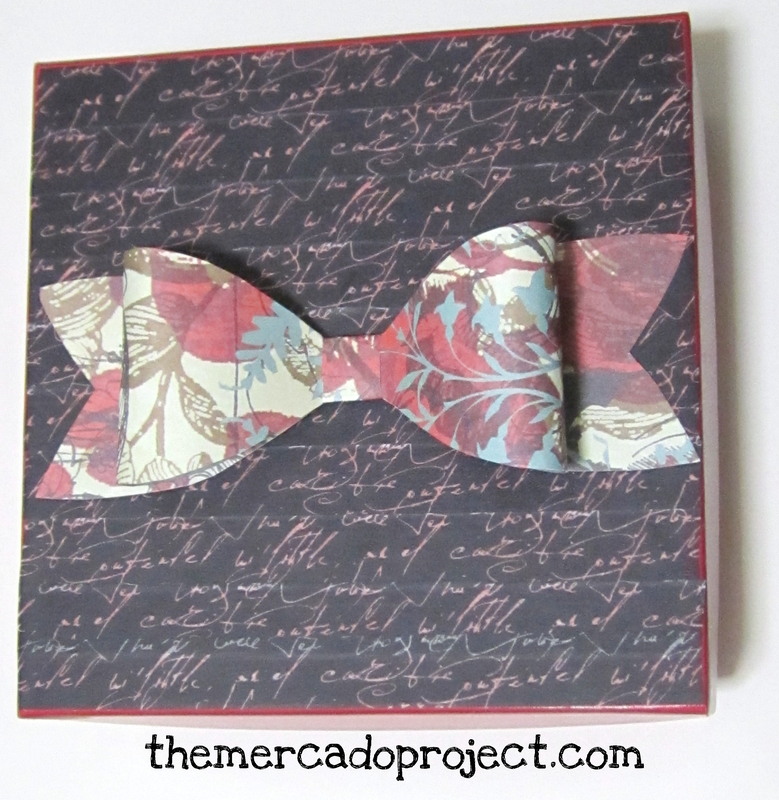 I wanted to see the finished box with a gift bow so I took out my scrapbook paper, which I also got on sale at AC Moore (buy, buy, buy) and my bow template courtesy of http://howaboutorange.blogspot.com/2013/04/how-to-make-paper-bow.html. 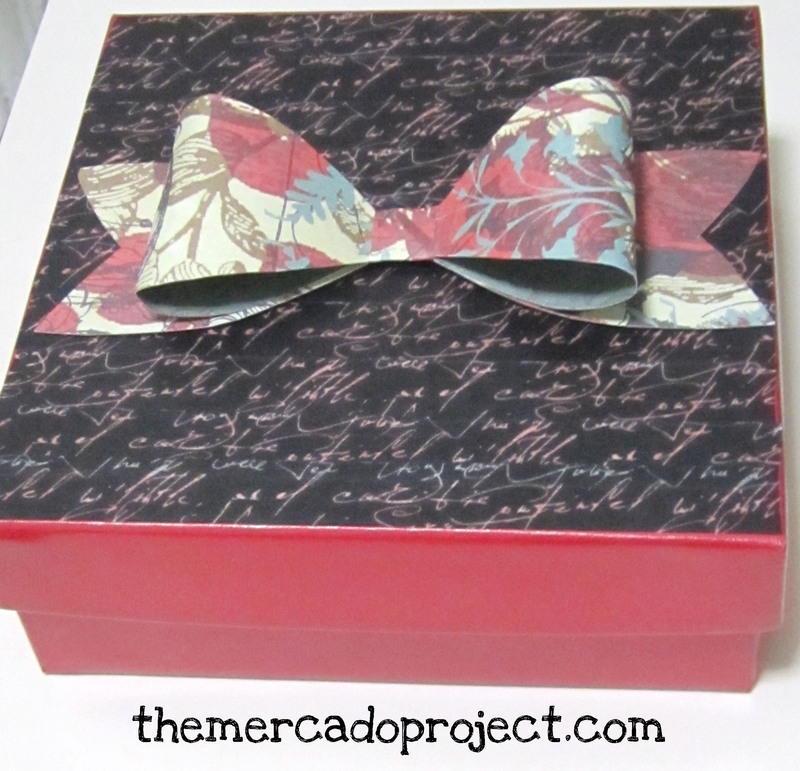 I love my cardboard red box now more than ever and if I was gifting this box, I would add the paper bow. 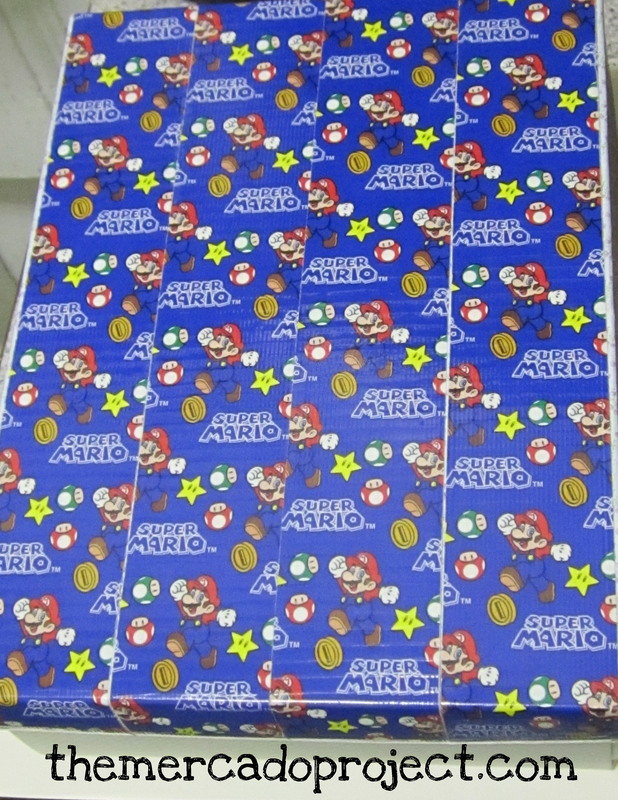 I decorated my kids play doh accessories box with the Super Mario (brand DUCK TAPE) design (found it at AC Moore, not on sale 😦 ). 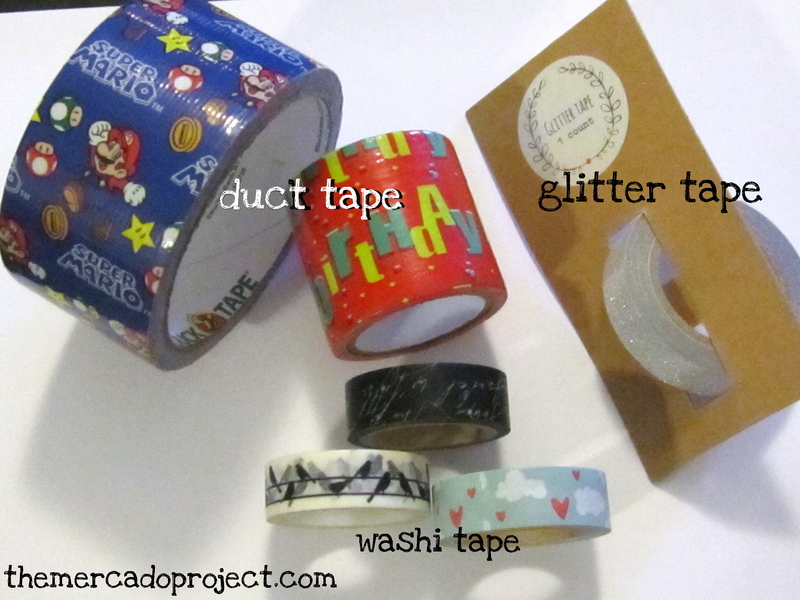 I found the birthday duct tape and glitter tape at the dollar section in Target. Yup, $1 . Score! The other washi tapes that I have are silhouette birds on a wire and cloudy sky with red hearts. I have a strong feeling this tape collection is going to be growing. I’m gonna need a big storage box, STAT! 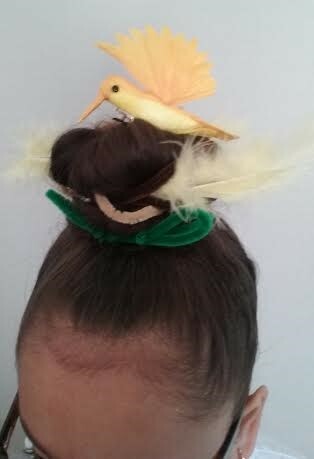 I have a great craft idea that came from my darling, beautiful and very crafty 6-year-old daughter, Olivia. 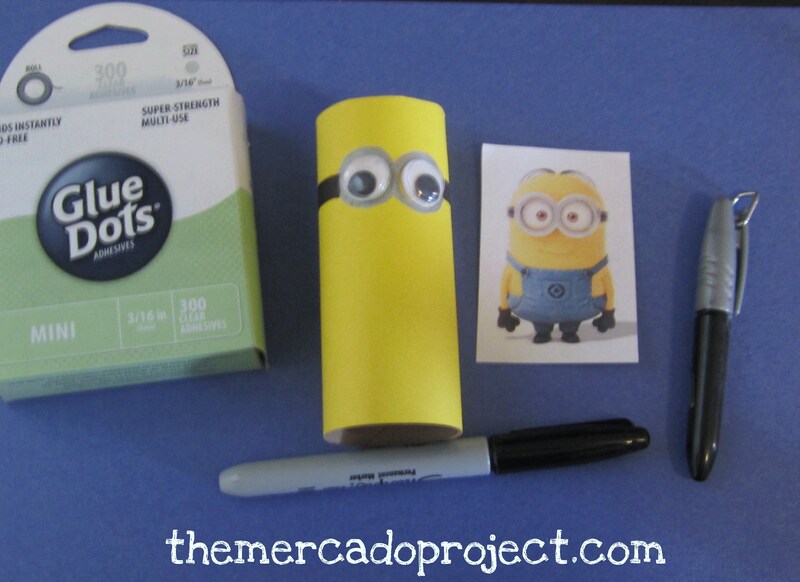 With a toilet paper roll, construction paper, glue, markers, scissors, and googly eyes Olivia made her very own minions from the movie “Despicable Me.” She came up with this idea on her very own so I’m sharing it with you step by step. Enjoy! 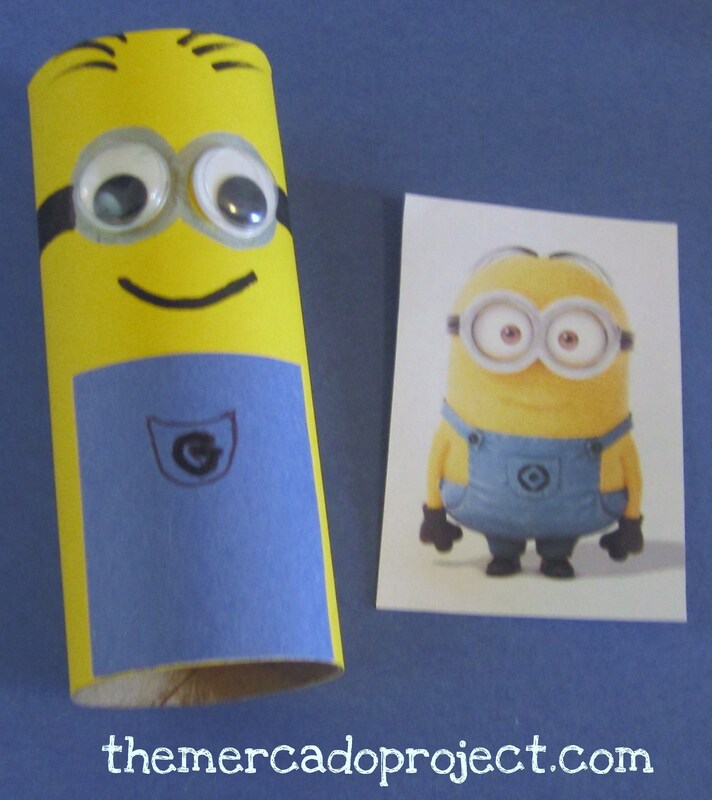 I covered the toilet paper roll with yellow construction paper. 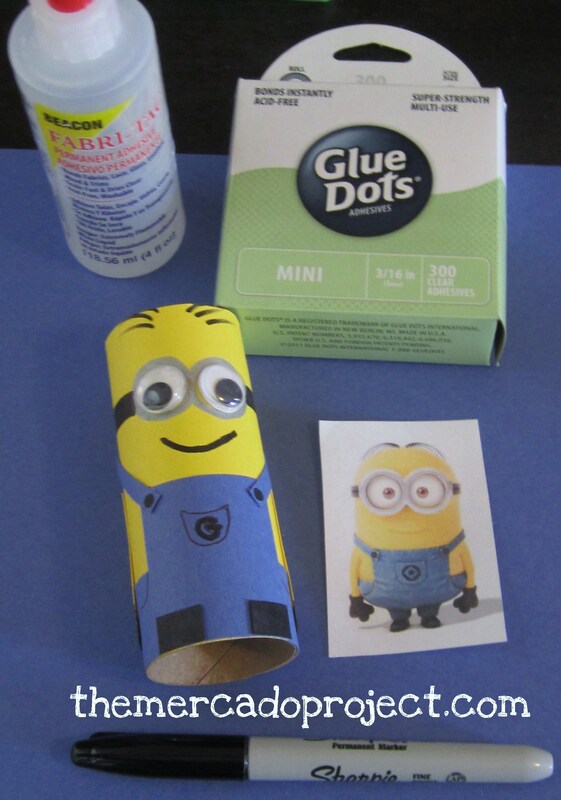 I added the googly eyes with the glue dots. Then traced around the eyes with the silver marker to make the goggles and used the black sharpie to make the band. Using the sharpie I drew the smile and hair. 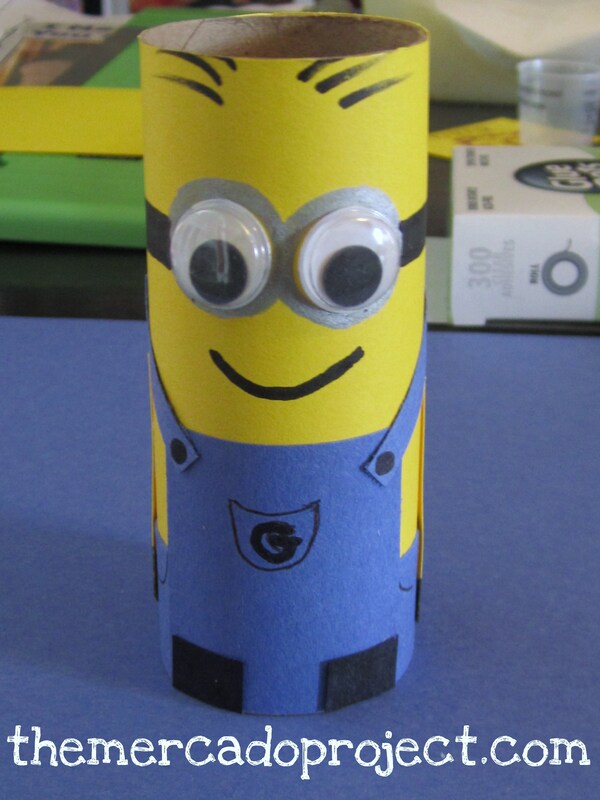 With the blue construction paper I made the front of the overalls, adding a pocket and the letter G for Gru. 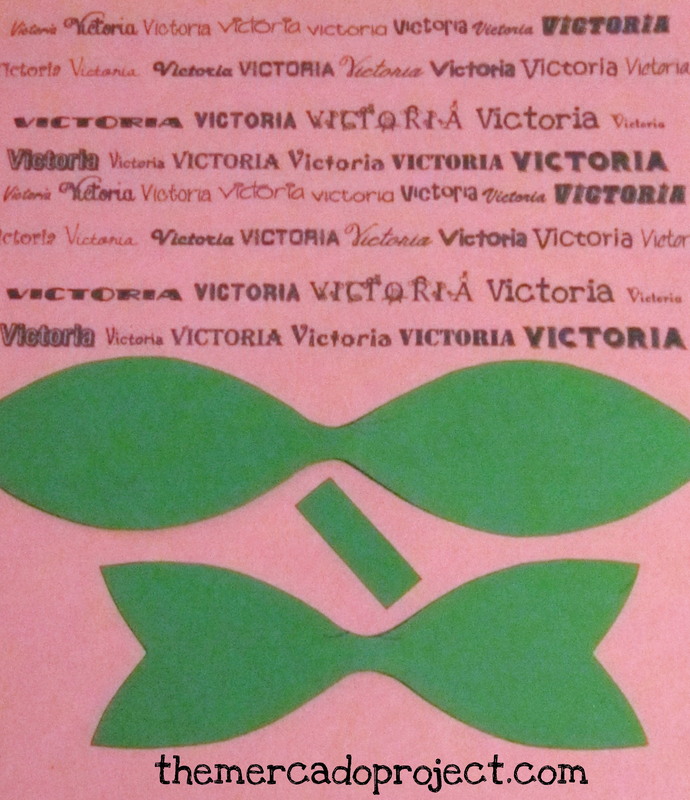 I glued the construction paper using the Fabri – Tac glue because it works best for me. 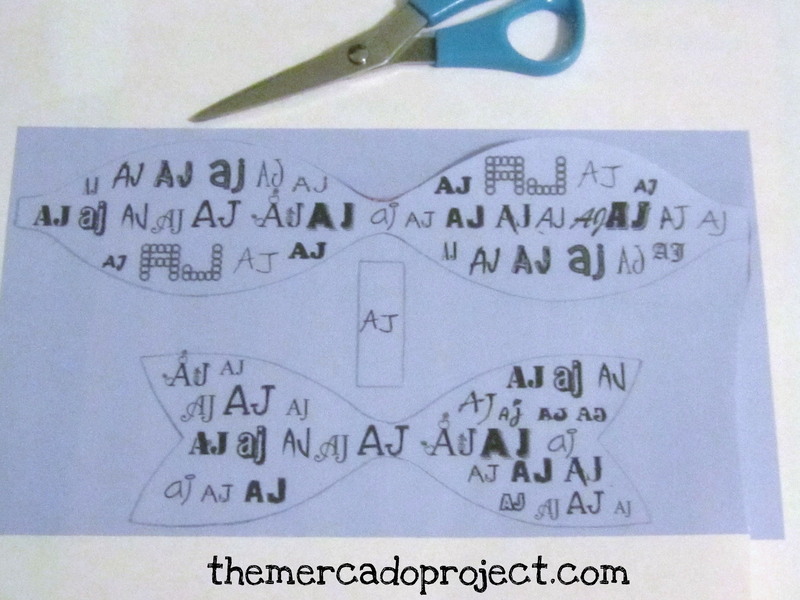 I used the glue dots for the small strips of construction paper. 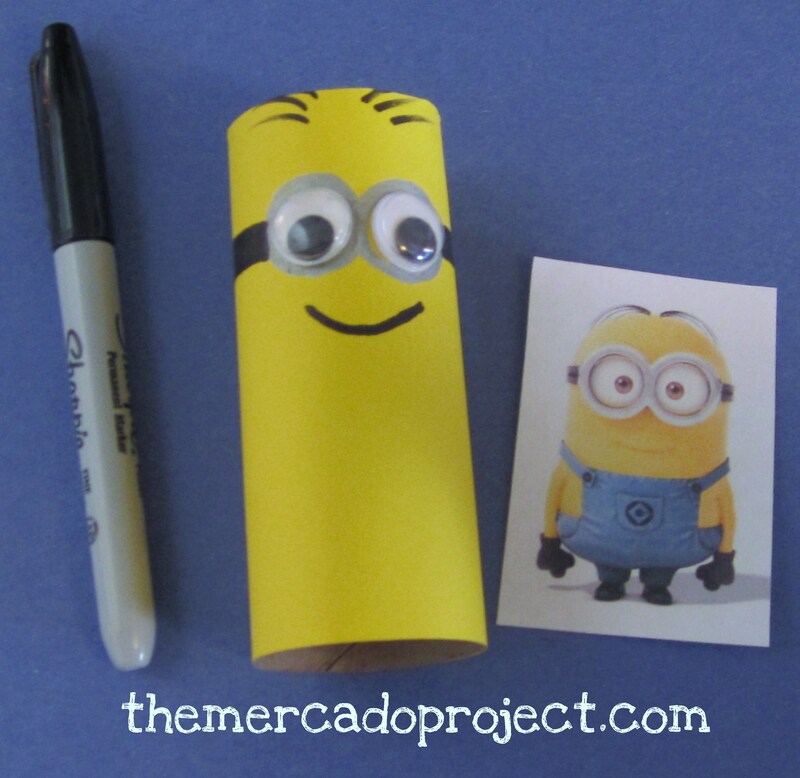 You can always make the Minion with one eye like the toy figure pictured. 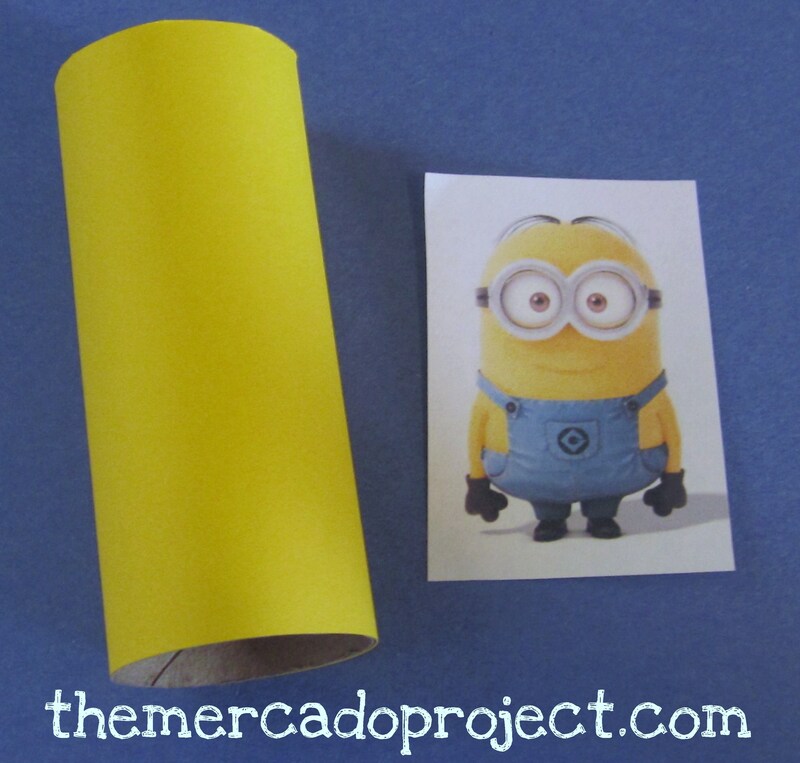 This is a fun craft project for your kids and it’s also a great decorating idea for any Minion party! 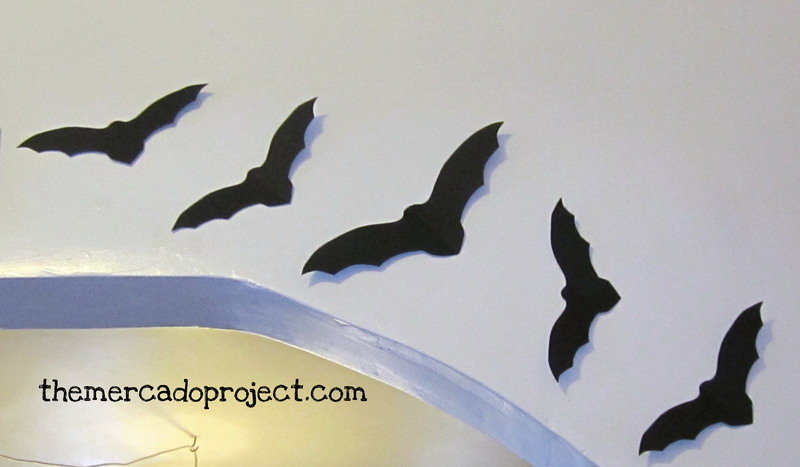 Bats, Banners, and Door Monsters…Oh My! 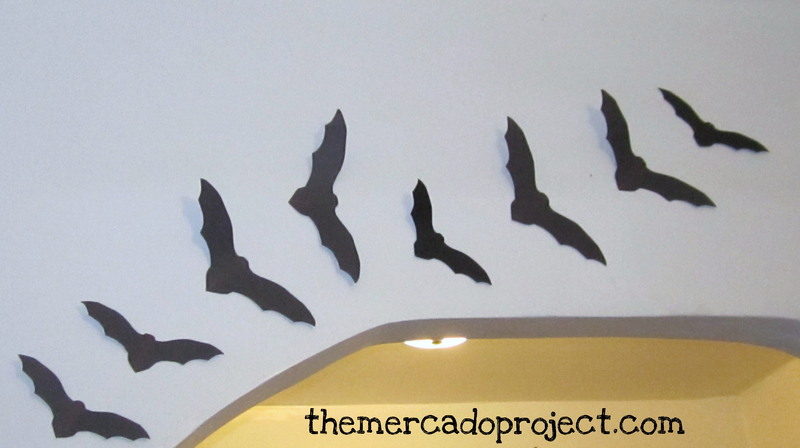 I had some bats stored away, but since I like them so much I decided to make some more. I simply used a bat template, printed on cardstock, and then traced with a pencil on black construction and cardstock paper. 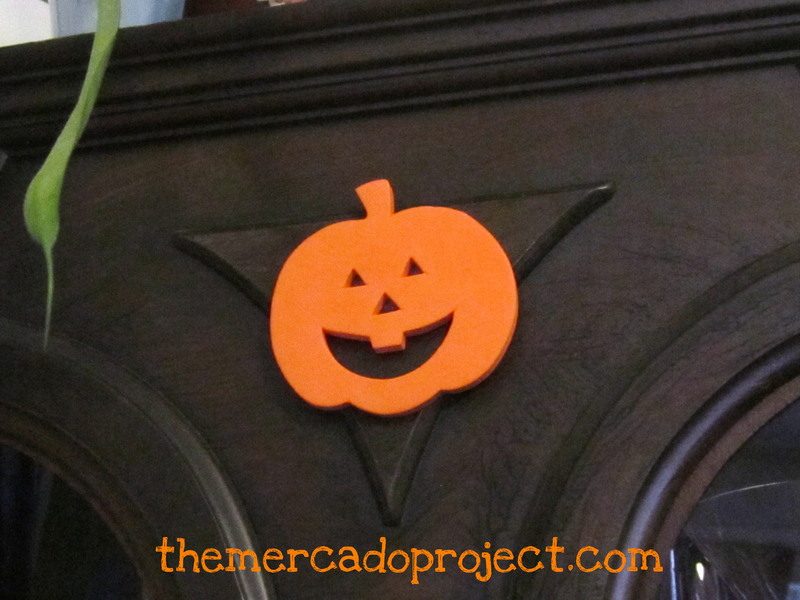 I taped them up on several walls in my living room as well as the entry wall. As soon as you walk in your eyes simply get drawn to them. 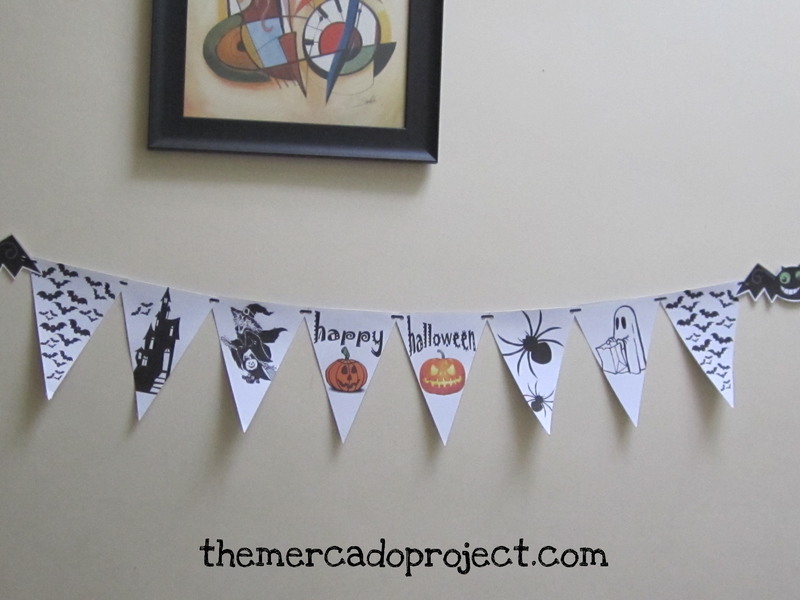 I made this pennant banner last year! 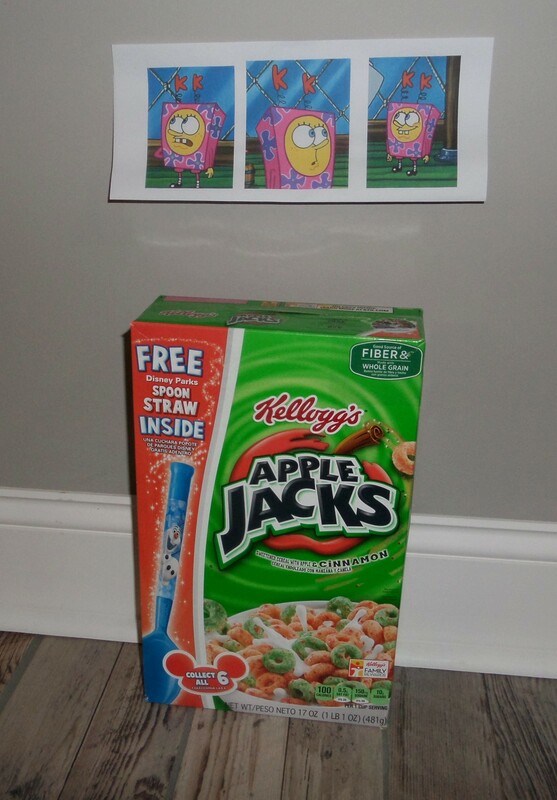 I placed it in the hallway outside my front door. I went to the craft store and found these small foam cutouts, in packs of five, and just taped them up in my living room. 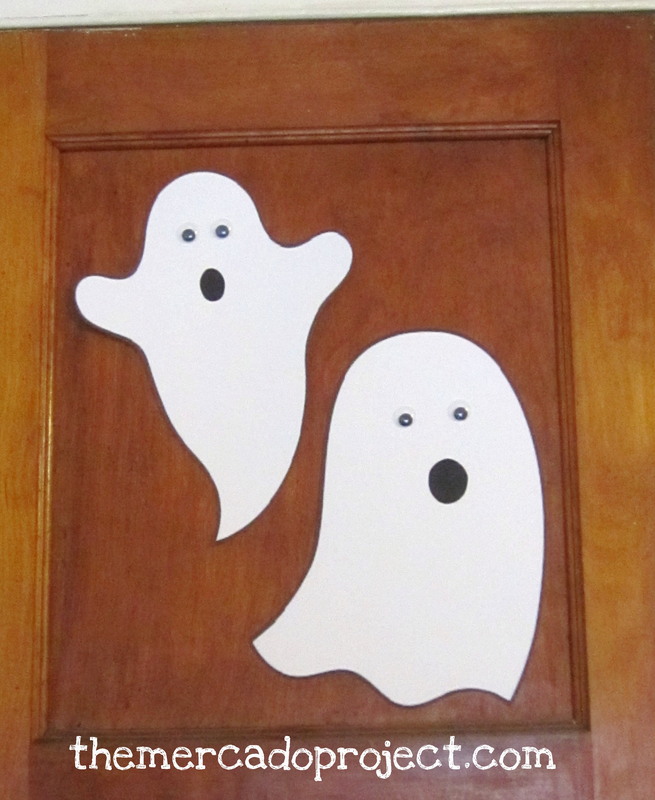 I searched for ghost templates and printed these cuties out on cardstock and just added googly eyes. 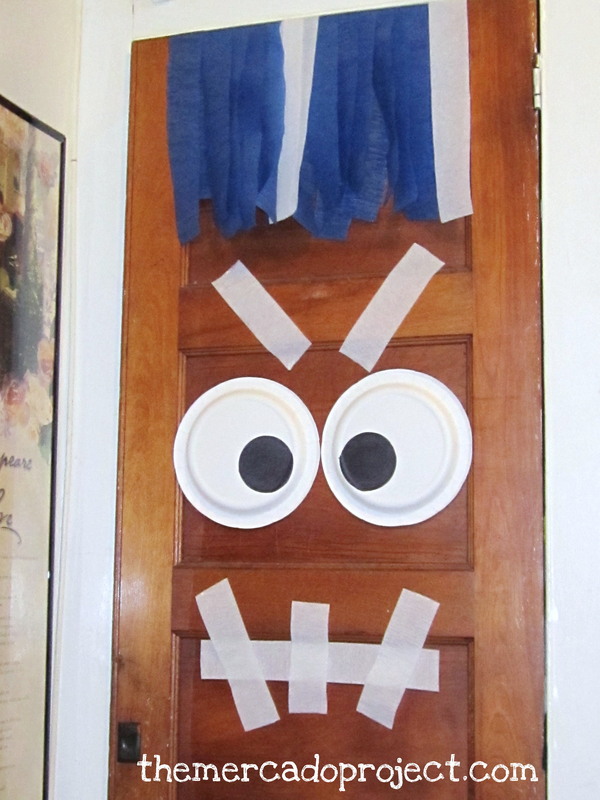 And last, but not least, my door monsters. Last year, I was inspired by a picture on Pinterest and decided to make my own. This year, I decided to make two of them. One on the door in my living room and another on the small closet door in my office space/playroom. 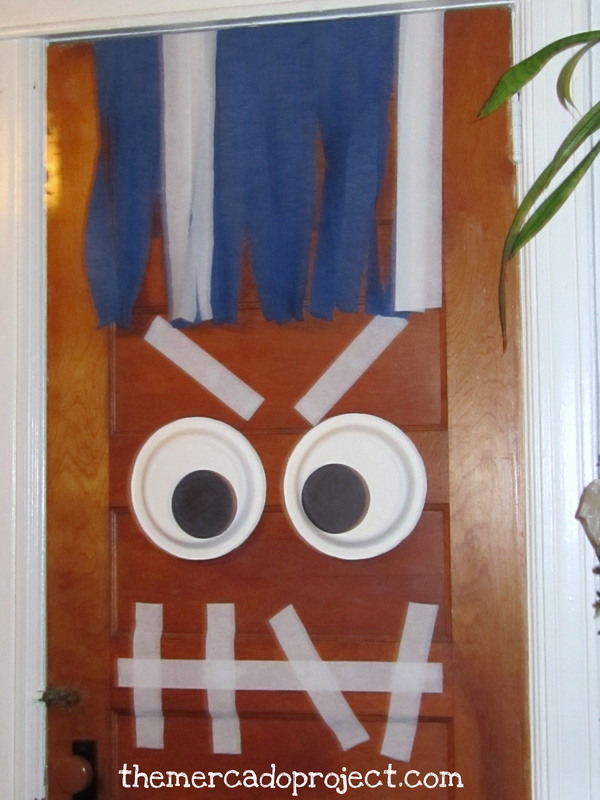 I used party streamer paper and paper plates for both monsters. My girls absolutely love these guys and so do I.